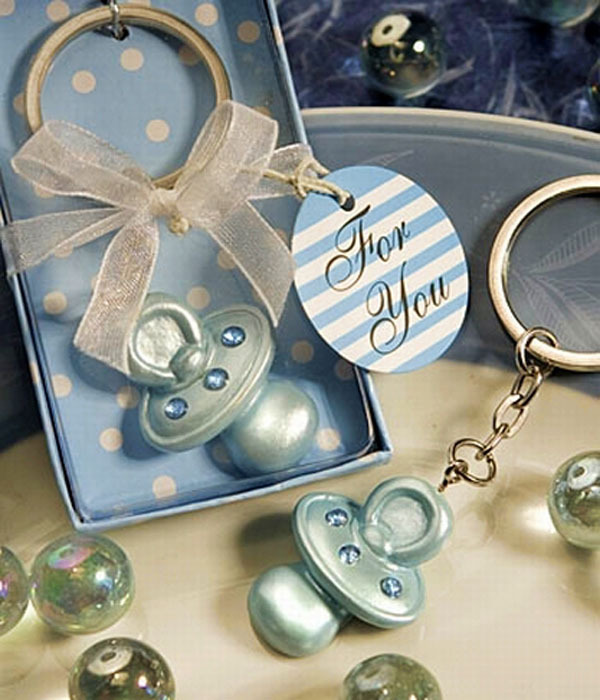 To make your baby shower an even more memorable event, give your guests the perfect baby shower favors! Friends and family will never forget the party you threw for your little angel with the right kind of mementos. However, finding the right party favor to give isn’t always easy. There are countless favor ideas to choose from which will make your decision even more difficult. The first thing you have to consider though is your theme. Your favor should match the theme of your baby shower, that way, your guests will not only be able to fondly reminisce your lovely baby shower but will also remember the beautiful decorations and invitations you and your friends worked hard to make. Another factor to consider is the budget of your baby shower. You’ll need to buy party favors for each of your guests and, depending on the size of your guest list, the price that you have to pay for this particular detail of the baby shower can range from moderate to uncomfortably expensive. However, baby shower favors don’t need to be that pricey. There are plenty of economical choices to choose from in today’s market. Better yet, why not give out homemade party favors? It will cost you less and will make your baby shower even more intimate and personal. 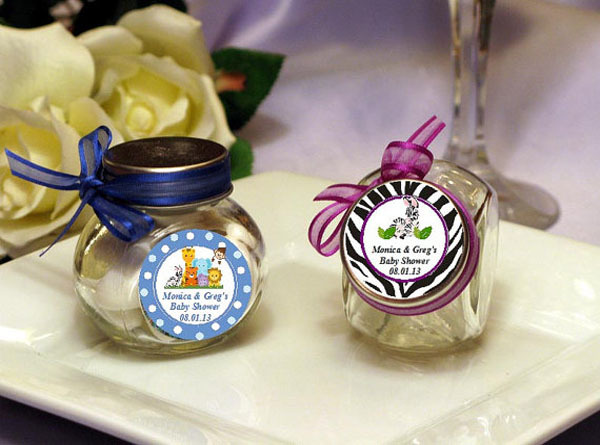 So for all mother-to-bes out there, make sure that you’ll carefully consider getting the right baby shower favors for your party! Baby Keychain – Who doesn’t love a good keychain? People are always losing their keys and what better way to help prevent such a problem than by giving out these cute baby keychains? 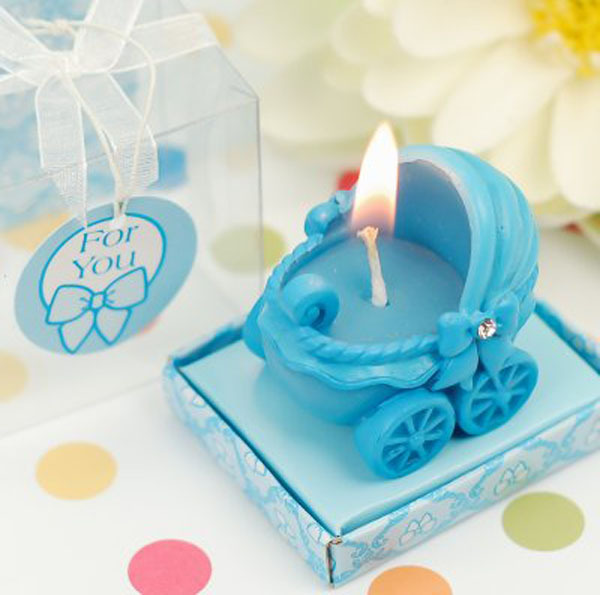 Adorable mini baby carriages will be great reminders of your baby shower. 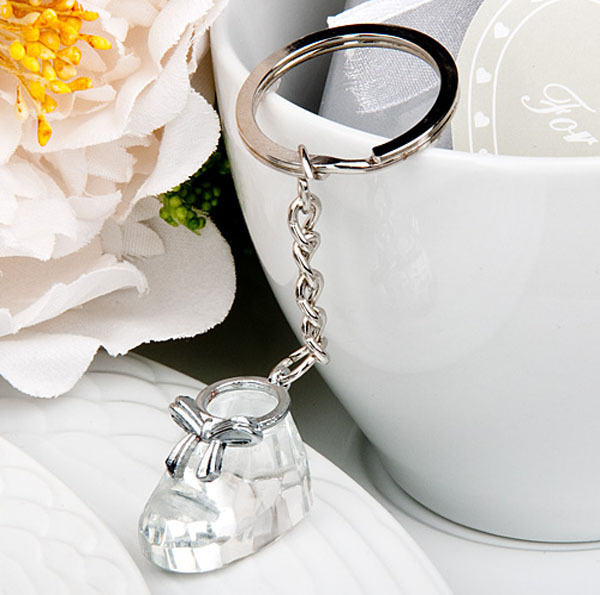 Tiny crystal baby bottle keychains are also an option. 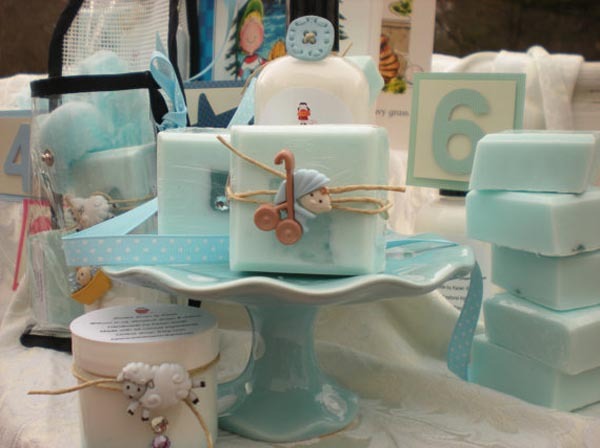 Scented Candles – How about handing out scented candles shaped as pastel colored baby blocks? Or how about a little baby bootee? Whichever design you choose, scented candles will delight and charm your guests. 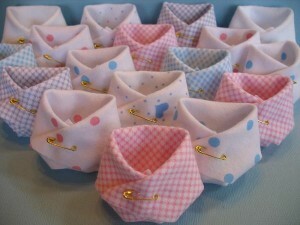 Baby Pacifier Charms – For those with a restricted budget, these cute pacifier charms are for you. They come in many colors from girly pink to boyish blue so these charms will be able to coincide with the color scheme of your baby shower. Baby Shower Bookmark – This baby shower favor is easy on your budget and makes a splendid keepsake. 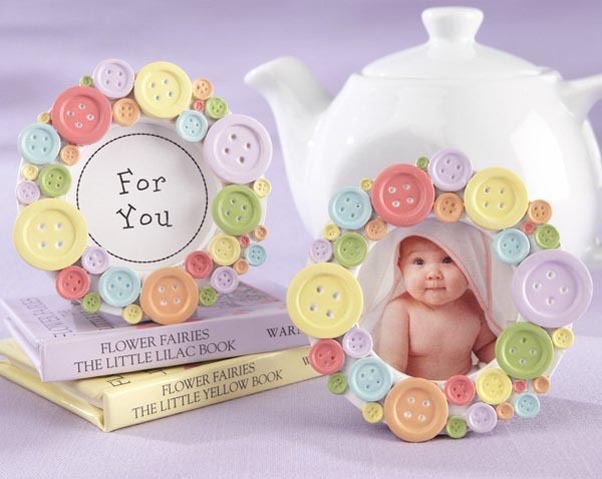 There are countless baby themed designs to choose from too. Baby stroller bookmarks are very cute and dainty. Baby rattles and stuffed animals are also quite popular. A huge advantage to choosing bookmark baby shower favors is that you can personalize them as much as you please. This is especially true to paper bookmarks. Scented Soap – Delightful to keep and fragrant to boot, these scented candles are wonderful party tokens. Whether you opt to get a rubber ducky design scented soap or a white dove shaped soap, this wonderful party favor will be a blast! 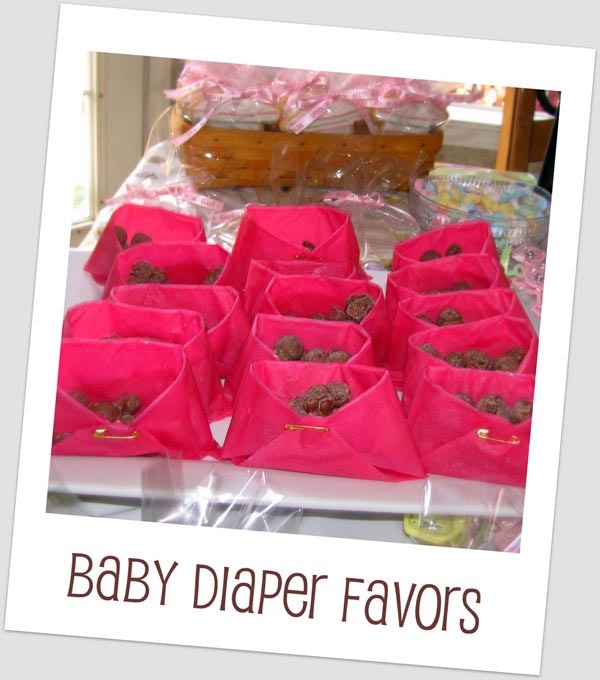 Diaper-Shaped Napkins – What you’re going to need for this is a cute patterned napkin and, if you prefer, some candy or nuts. The napkins are folded into a shape of a diaper that you could then fill with candies or other treats. It’s easy, inexpensive, and adorable! Tiny Picture Frames – You can either make your own picture frames from scratch or buy plain white picture frames from a store and then hand paint them. Whichever you choose, this gift is very personal and charming. You can even put a picture of you and your friends in the picture frame. 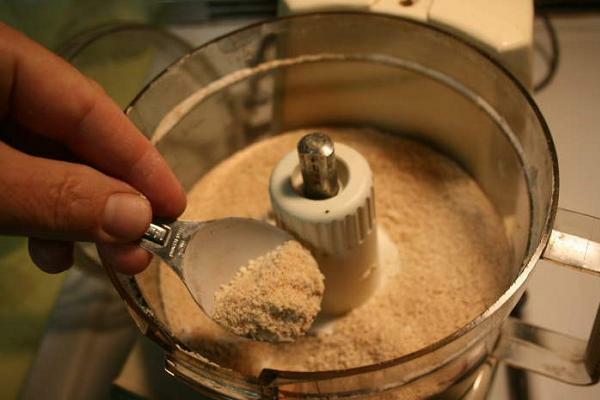 Egg Timer – Someone’s in the kitchen with baby! This clever little token is a perfect symbolism of almost due mothers, they’re about to hatch too. 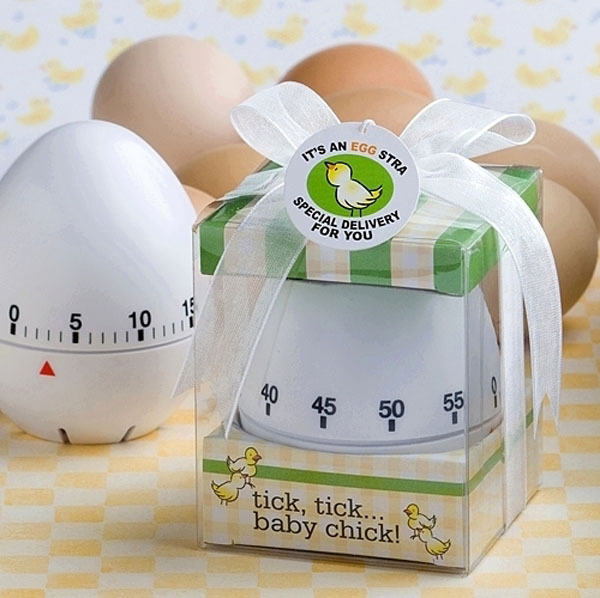 Egg timers are not just adorable party favors; they’re also very useful in the kitchen. Crystal Baby Bootee – If you want a touch of class on your baby shower favor, elegant and divine crystal baby bootees is a great idea. These crystal charms are very lovely and modern. Your guests will fall in love with them! 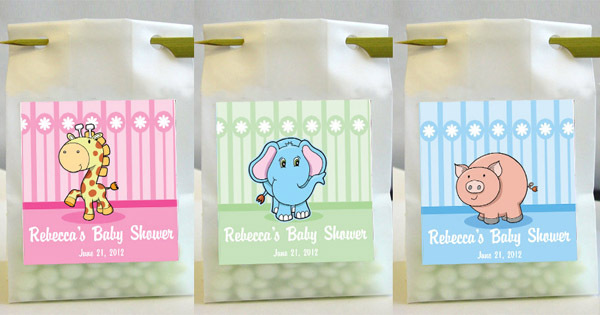 Personalized Hand Sanitizer – Your guests will appreciate these handy baby shower tokens. They’ll be able to stay germ-free with these hand sanitizers. They can be personalized with pictures or text too so even after the baby shower is over your guests will be able to remember your special day. Baby Boy Glass Candy Container – It’s a boy! 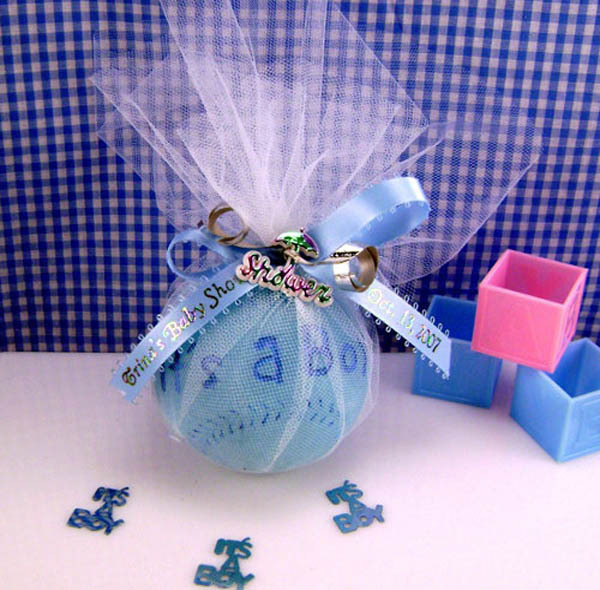 Celebrate your bouncing baby boy with a candy container that has a cute and boyish design. 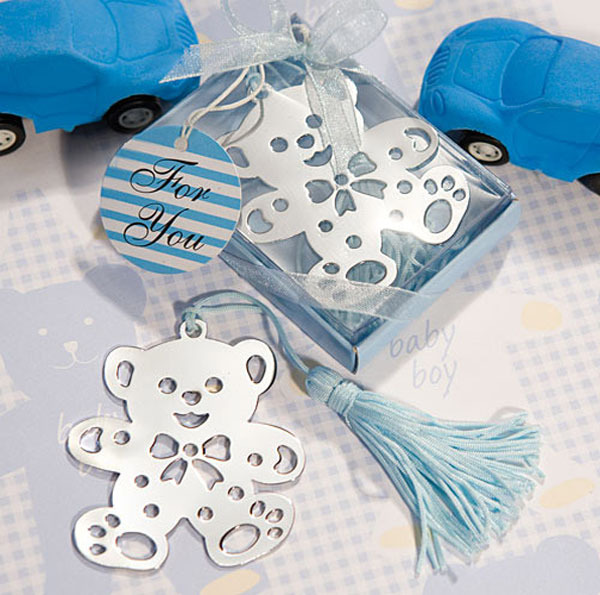 This sweet baby shower favor will show your guests how excited you are to meet your sweet little prince. Baseball-Themed Baby Shower Favors – If you’re hoping to have an athletic boy soon, or if you’re a fan of the sport itself, why not give out these baseball-themed baby favors on your baby shower? These adorable sporty candles will be a real hit with your guests. Mini Purses – Expecting a little girl soon? 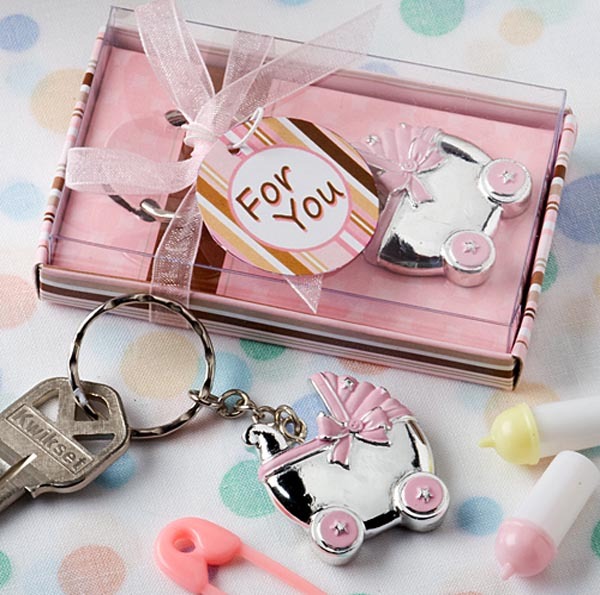 Give your guests these endearing little purses in celebration of your little lady-to-be. These purses can be used to hold make-up or keys or random little trinkets. 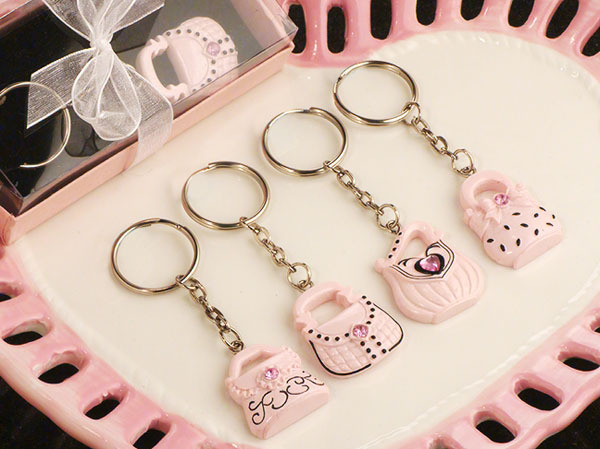 Girly accessories like these are perfect for moms waiting for their little girls. Personalized Lip Balm – Fashionable and functional! Handing out lip balms on your baby shower is a great idea if you’re expecting a baby girl. Darling lip balms like these will be loved by all of your guests. 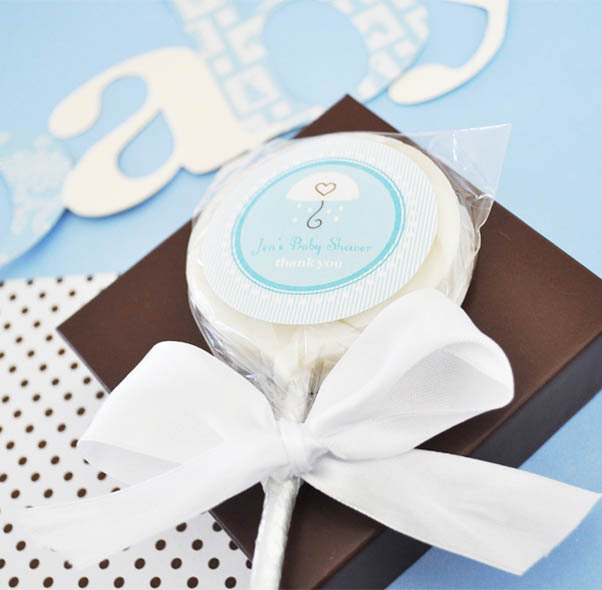 Personalized Lollipops – You can get all sorts of baby shower lollipops anywhere! It can have the words “It’s a boy!” or “It’s a girl”, or a baby shower themed picture. A great thing about these lollipops is that they also come in all sorts of shapes and sizes. They look so good that your guests won’t have the heart to eat them! 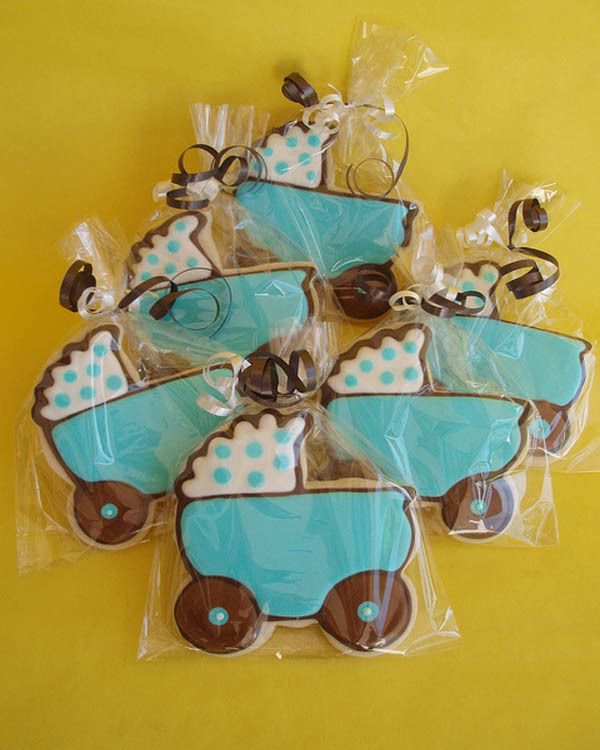 Baby Shower Cookies – Adorable little treats that can be made at home or ordered from a store. Cookies like these come in different designs like a baby stroller or a pacifier. These sweet treats will leave your guests hungry for more. Bag of Baby Shower Candies – Not only are the candies tasty, the bag can look just as sweet too. You can customize the bags however you want. You can even buy those cute baby shower bags that come in all sorts of designs and patterns. 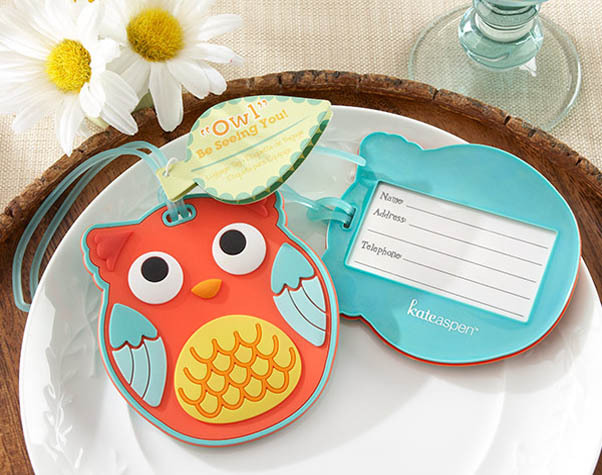 Owl Luggage Tag – Your guests will squeal with glee when they see these cute party tokens. They can be used for ordinary bags or, to friends who love to travel, for luggage bags. Now no one will have to keep asking to whom these bags belong to with handy owl tags like this. 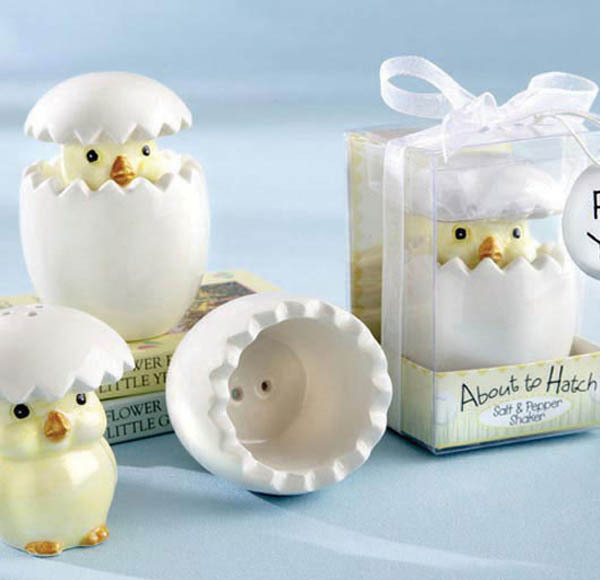 Baby Chick Salt and Pepper Shakers – For those who want some spice in their life, these lovable salt and pepper shakers will be perfect for them. The design of this baby shower favor is really clever and creative. Initially, it looks like an egg with a baby chick peeking out. The top of the baby chick’s head is the pepper shaker and once remove the chick from the egg you’ll find that the bottom of the chick is the salt shaker. These chicks ought to shake things up. Butterfly Coasters – If you’re an avid lover of the colorfully winged beauties, having these at your party will kick things up a notch. Coasters in the shape of a butterfly will be adored by your guests. 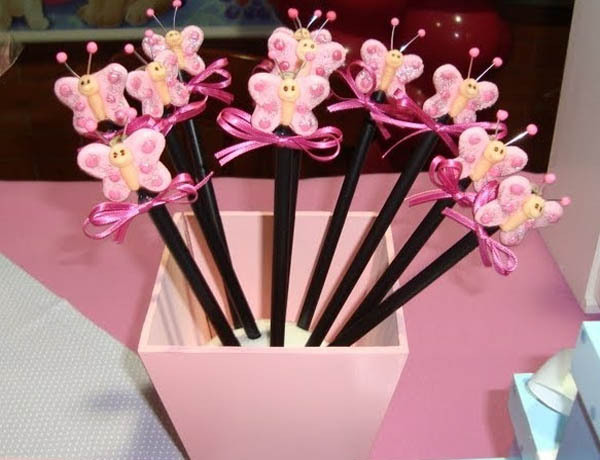 Butterfly Bookmarks – Simple yet elegant, these baby shower favors will charm your guests. With these butterfly bookmarks, they’ll always remember your perfect baby shower whenever they turn a page.